When the New Enterprise Incentive Scheme, run in Geelong by Netgain, needed a vibrant new design for their ‘Exploring Being Your Own Boss’ program, we delivered on less than a 12-hour turnaround. The existing course materials template was dated, and not visually engaging. The client wanted a look and feel that would convey the brand promise of the course – of exploring, adventuring and taking a risk. Using this nifty Trianglify Generator, a polygon background was designed using the existing brand colour palette. This provided the background imagery for the Powerpoint deck and Microsoft Word templates. This was complemented by font selection and layout. 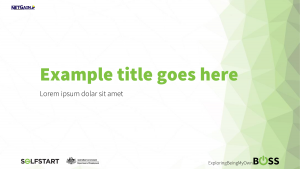 To make it easier for the client to utilise the templates in the future, the Master Slide was altered to reflect the new branding, and a Stylesheet was added. The end result is an easily re-usable, visually engaging templates that can be applied across a range of documents. When the New Enterprise Incentive Scheme, run in Geelong by Netgain, needed a vibrant new design for their ‘Exploring Being Your Own Boss’ program, we delivered Powerpoint and Word templates with customised styles on less than a 12-hour turnaround.